Acorns seem like the bridesmaid of autumn. They always play second fiddle to pumpkins, don’t you think? Let’s give acorns their moment, shall we? Besides, I’ve already written about pumpkins a million times. My son and I painted a tic tac toe board when he was 5 years old and in kindergarten. He’s in 3rd grade now and learning multiplication and I’m in denial. The original tic tac toe game pieces were also made by my son…out of perler beads. I have ranted waxed poetically in the past about my feelings on perler beads here and here. You should really read those tales. My melodrama was solidly on point. The perler bead game pieces didn’t survive our move home from Ireland. I can’t imagine what could have happened to them. No idea at all. Nope. None. The tic tac toe board is still in excellent condition though thanks to the solid craftsmanship of my kindergartener. It just needed some new playing pieces and I happened to have the perfect thing on hand. Remember how I walked around the neighborhood saving all the acorns from being crushed by cars? Due to my heroic acorn rescue efforts, I had plenty of acorns on hand. I could spare 10 acorns for this tic tac toe project. 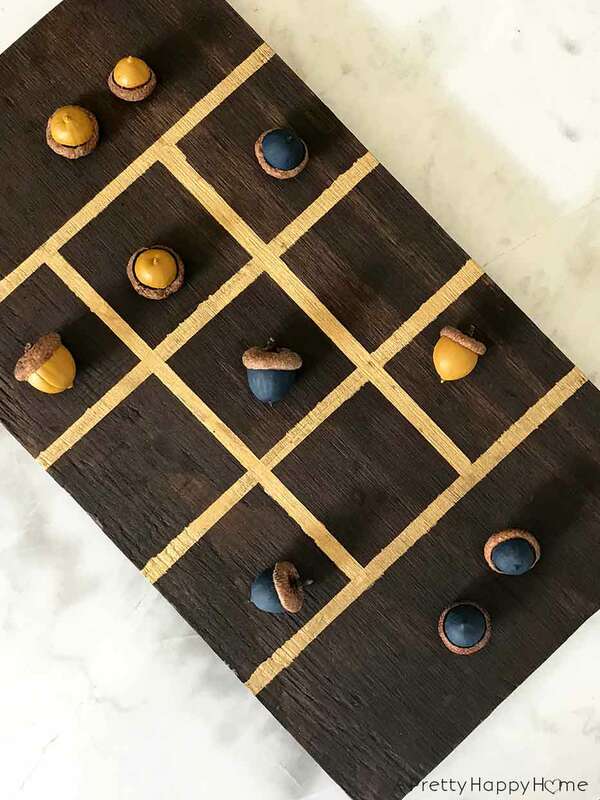 All it took was a small paintbrush and an even smaller amount of craft paint and this acorn tic tac toe project was done in about 2 minutes. 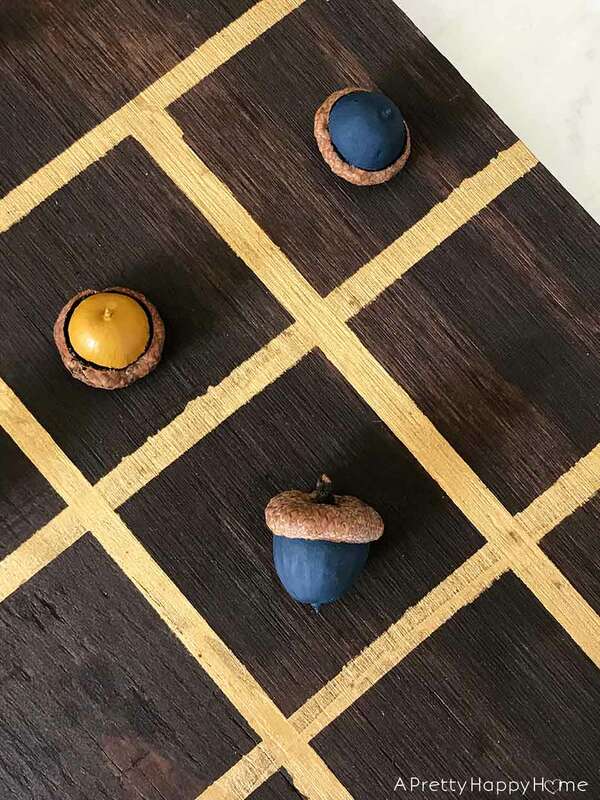 Are the acorn playing pieces durable? I love this dialogue, by the way. You guys are so inquisitive. My son is an enthusiastic tic tac toe player. He likes to bang the acorn playing pieces on the board. Especially when he plays the winning piece. He really is quite good. During one of our marathon tic tac toe sessions, I found myself admonishing him to be gentle with the acorns. Then I remembered these acorns either fell or were thrown by a squirrel 50 feet out of a tree onto the hard pavement and didn’t break. I think they can survive a game of tic tac toe with a 3rd grader. Besides, I have at least 100 more acorns I can paint in a pinch if I need a replacement. Happy tic tac toe playing! 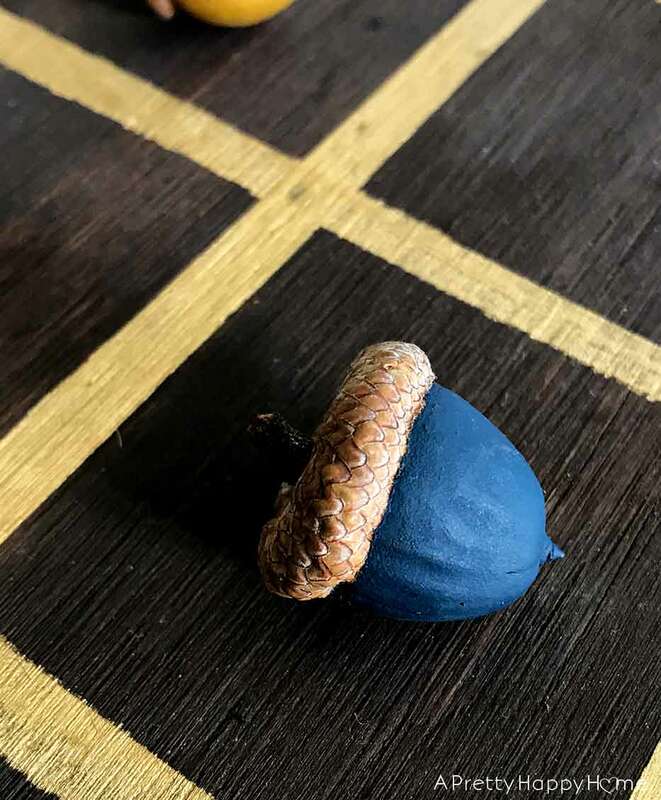 If you collect fresh acorns and want to make sure nothing is going to crawl out of them later, here’s how you dry them. You can also buy artificial acorns . If you care about your painted acorns being super durable you could also spray them with a clear sealant like this one . Mod Podge would work too! If you don’t have a permanent tic tac toe board like we made, you can make a temporary one out of a piece of cardboard. Click here for an example of a cardboard tic tac toe game I made a few years ago for a party. It’s super easy and a great way to get some use out of all those Amazon boxes. Thanks for sharing part of your day with me. Here are some other posts you might enjoy!